Wow... I am so sorry I worried many of you by not blogging yesterday. I had gotten up late (was up during the night...ugh!) and began to sew... well - before I knew it, time had flown by and I was deep into my sewing and it was almost 10:00 am and I realized I had not blogged. So.. I kept sewing! HA! I will finish up my project today (adding borders) so I will have a picture for you tomorrow. This little project will be in the newest issue of Primitive Quilts & Projects. The magazine editors sent it to Karen (Cinnamon's Quilt Shop Owner) early to give the shops time to make a sample and get some kits ready. So... That's what I have been working on! It's simply adorable!! The first involves bias binding. Now... I'm not sure why I have a mental block with this... BUT I DO! For the life of me... I can't ever remember how to fold the fabric. I've gotten some weird shape cuts for my binding... (I'm admitting this right up front!). Then... I lost my great friend, Val - she had to up and move to Texas! She was my "bias fabric folding guru" !!! I would go to her (at the OGC) and she would fold it for me. Then.. I would say to myself... (self... remember this... you are an intelligent woman...remember this!) Of course... I would forget it! Are any of you the same way with this? Please tell me... it's just not me!! 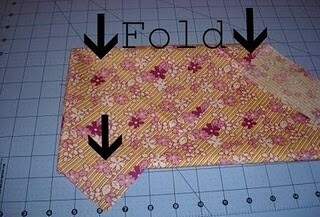 This blog has GREAT pictures to show you step by step how to do this! Print out the pictures and put them in a notebook and you'll have them for future reference! Then... we have the zipper!!! OMG... I get a "wheezie" tummy when someone mentions a zipper. I think it's because I have not tried the wonderful NEW way these gals put them in! 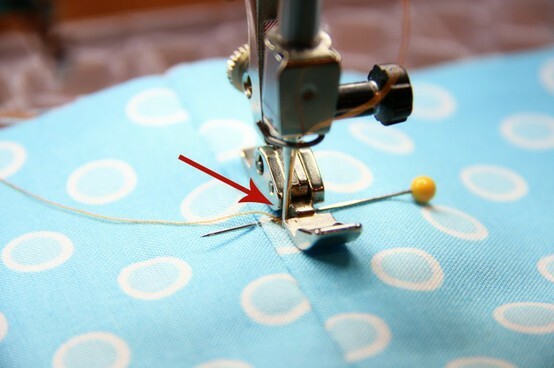 I'm still on the old mind set (from my mother) of how to put in a zipper... eeeekkkkkkkk!!! I know they have new and improved ways... and here is a web site to show you how!! Okay... two BIG fears of mine have been solved.... here come some more!!! The next... those shower doors... that we are supposed to keep sparkling clear! HA!!! What a joke that is! Question - why can we send men to the moon, cure diseases, and all of this other wonderful stuff... but we cannot keep water marks and soap scums from making our shower doors look like a lava pit???? I just don't get it!! Keeping shower doors clean and streak free is a challenge—unless you know the pros' secrets. Start by cleaning any mold, mildew or streaks off the glass with a glass cleaner. Use a Mr. Clean Magic Eraser ($1) to get into the cracks in textured glass. Scrape off tough buildup with a razor blade. Dry the doors with a cloth. Treat the doors with a product like Aquapel ($8; autobodydepot.com) or Rain-X ($5 at auto parts stores and home centers). These glass treatments form an invisible film on the glass to increase water repellency, causing water and soap to bead up and run off the glass. (Squeegee off the water after bathing to keep soap scum from building up again.) Spray or wipe on the glass treatment, then wipe it off with a microfiber cloth. Over spray won't harm surrounding surfaces. The products repel water for six months. Next... is the dreaded chandelier !!! OMG - I wish I would have known about this stuff when I had the store!!! Cleaning a chandelier the old-fashioned way—spraying and wiping each piece by hand—takes forever. And it doesn't help that you're standing on a ladder. Want an easier way? Try a spray-on chandelier cleaner. First spread a plastic tarp on the floor under the chandelier to catch the drips. Then turn off the light and spray the solution on the chandelier until liquid beads start to run (you'll use a lot of spray, but it beats wiping). The spray rinses off the dust. The solution that's left evaporates quickly and doesn't leave water spots. The spray works well on hanging crystals, but don't expect it to remove dust from crevices. Buy it for $10 from nancysilver.com or chandelierparts.com. And... last but not least... the dreaded - CLEANING THE KITCHEN CABINETS !!! Now... I have beautiful cabinets in my house... LOVE THEM! However, I do know they need cleaning! The great thing about my cabinets... you really can't tell they need cleaning... but YOU know how that goes... YOU KNOW they need cleaning! Right? Well... it's just one of those things I HATE TO DO!! Then... I found this cool way to do it.... read on!! Grease and dirt build up on kitchen cabinets over time. To clean your cabinets, first heat a slightly damp sponge or cloth in the microwave for 20 to 30 seconds until it's hot. Put on a pair of rubber gloves, spray the cabinets with an all-purpose cleaner containing orange oil ($4), then wipe off the cleaner with the hot sponge. Doesn't this sound so much easier? I'm getting me multiple sponges so those bad boys will be heating up while I'm using others! Then.. can you imagine the yummy smell of your kitchen with the "orange scent" that you will be using for your cleaner. I'm there!!! I've already put it on my grocery list!!! I even know where my step stool is... my cabinets are VERY TALL!! Hey... while I'm up there I can even clean the top of the refrigerator (yes... I hate that job too!) I'm glad I'm short enough that I can't see it! And... last but not least... it's something NEW coming into my house!! We are to use them for everything that we clean... mirrors, countertops, windows, tv screens, etc. Throw out the old t-shirts, dishcloths (we use for dusting, etc.) and go with the new micro-fiber cloths. They can be thrown in the washer and used over and over... no more wasting money on paper towels! These are on my shopping list too!!! 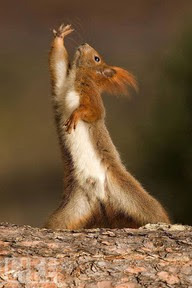 Look at this crazy squirrel... doesn't he remind you of John Travolta - dancing... ? ?